Are We Close to a Cure for Diabetes? Those with type 1 diabetes (diabetes mellitus) do not produce any insulin—the insulin-producing beta cells (β-cells) in their pancreas don't function properly for reasons that are not 100 percent clear. As a way to manage blood sugar levels, they rely on man-made insulin, injecting insulin multiple times daily or wearing an insulin pump, carbohydrate counting, and frequently testing their blood sugar. However, scientists are exploring creating human islet cells (insulin-making cells) from stem cells, with the aim of transplanting these cells to help those with diabetes wean off insulin. Transplanting islet cells produced from stem cells is a developing area of research and is currently being used in animal studies. 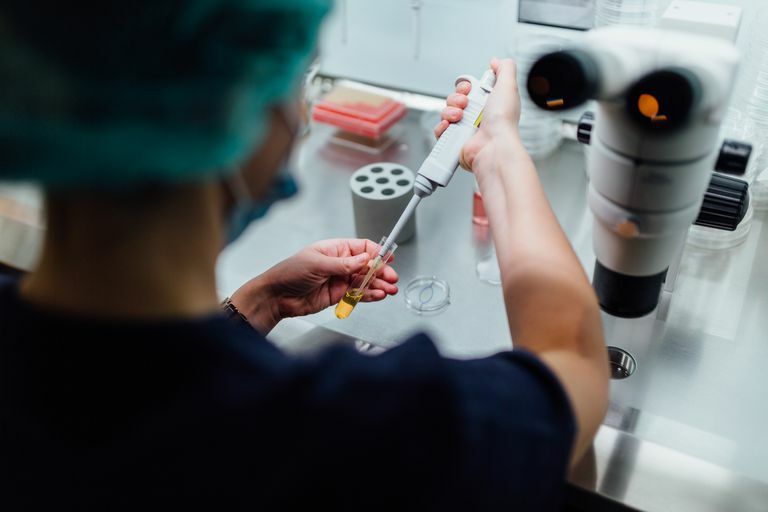 However, according to the National Institutes of Health, there are two other types of more established islet cell transplantation that are being used in carefully selected people with diabetes. What Is Islet Cell Transplantation? Pancreatic islet cell transplant, also known as beta cell transplant, is a process in which beta cells, either from human donors or cells created in the lab, are transplanted into a person with type 1 diabetes. The hope is that they secrete insulin and help regulate blood glucose, as normally-functioning beta cells would. To date, patients transplanted with deceased donor islet cells can be made insulin independent for multiple years. However, this strategy is limited because of the scarcity and quality of donor islet cells. In addition, it is important to note that cell transplantation is an experimental procedure and will be labeled such until transplantation technology is considered successful enough to be labeled therapeutic. Currently, two types of transplantation exist. This type of transplantation involves taking islet cells from a deceased donor and purifying them. After purification, the cells are processed and transferred into the recipient. This type of transplantation has been used in certain patients with type 1 diabetes whose blood sugars are very difficult to control. Ideally, transplantation would result in normal blood glucose levels without the use of insulin injections or infusions, or at least would reduce the amount of insulin needed. Another goal is to reduce hypoglycemia unawareness—a dangerous condition in which people cannot sense their low blood sugars. Transplant patients typically receive two infusions with an average of 400,000 to 500,000 islets per infusion. Once implanted, the beta cells in these islets begin to make and release insulin. When receiving transplant cells, you must be on immunosuppressive drugs to prevent rejection. This can complicate diabetes because over time these types of drugs, such as corticosteroids, can increase insulin resistance, causing a rise in blood sugars. Other types of immunosuppressive drugs may reduce beta cell ability to release insulin. And lastly, these types of drugs reduce the immune system, which can increase the risk of infection. Hence, it's clear that this process doesn't come without limitations and uncertainties. Allo-transplants are not conducted in all hospitals—hospitals must have permission from the United States Food and Drug Administration (FDA) for clinical research on islet transplantation. A doctor who specializes in medical imaging, a radiologist, is typically the one who performs the transplants. He uses x-rays and ultrasound imaging to guide the placement of a catheter (a thin, plastic tube) through a small incision in the upper stomach into the portal vein (a major vein that supplies blood to the liver). Once the catheter is inserted in the proper position the islet cells are slowly pushed through. Typically, patients are given local anethesia and a sedative during the procedure. Researchers believe that patients need about 350 to 750 million cells to stop the use of insulin altogether. Therefore, most patients need multiple transplants. This type of transplantation is performed following total removal of the pancreas (a pancreatectomy) in patients with severe and chronic pancreatitis that cannot be managed by other treatments. The idea is to maintain insulin production and secretion because removal of the pancreas can lead a person to develop diabetes. Patients with type 1 diabetes cannot receive this type of transplantation. Compared to whole organ transplantation, islet cell allo-transplants are much less invasive. Successful allo-transplantation would improve blood glucose control and limit or reduce insulin use for extended periods of time. This would mean that patients would not have to inject insulin or infuse insulin through a pump multiple times a day. Better blood sugar control may potentially reduce or slow down the risk of diabetes complications such as heart disease, diabetes-related neuropathy (nerve damage), and retinopathy (eye damage). Additionally, with allo-transplantation, even partial function after a transplant can reverse hypoglycemia unawareness, helping patients feel symptoms such as sweating, shaking, increased heartbeat, anxiety, or hunger, and treat them accordingly. The transplant procedure can increase the risk of bleeding and blood clots. There is also a chance that the transplanted cells may not work well or at all. In addition, all of the cells may not work right away and may take time to start functioning properly. Therefore, recipients may need to take insulin until the cells begin working properly. There is also a risk that the autoimmune response that initially destroyed the person's native cells can be triggered again, resulting in an attack in the new cells. Researchers are currently trying to investigate if using other areas of the body for transplant can prevent this from happening. In order to prevent rejection of the cells, you must take immunosuppressive medications that lower the immune system. These drugs can also increase blood sugars. Immunosuppressive medications are not needed in the case of an auto-transplant because the infused cells come from the patient's own body. One major obstacle is that there is a shortage of islet cells from donors—many times there are not enough healthy cells to transplant and there aren't enough donors. As you can imagine, this type of procedure is also costly. While patients might be saving money on insulin, the cost of the procedure, appointments, and immunosuppressive medications creates financial barriers that prevent the widespread use of islet allo-transplantation. Scientists are working hard to perfect islet cell transplantation. There has been some research presenting the ability to create human beta cells from stem cells in a lab. It is believed that these cells would generate a larger amount of more efficient islet cells. And although there have been many advancements, much more work needs to be done in this area before transplantation becomes a therapeutic option. Perfecting this method could bring us one step closer to curing diabetes. Islet cell transplantation, specifically allo-transplantation, is currently being used on a very select population of people with type 1 diabetes who have an extremely difficult time managing their blood sugars or have a severe case of hypoglycemia unawareness. Transplants are only performed in clinical research hospitals that have had approval by the FDA. Animal studies have suggested that the beta cells created from stem cells and used in transplant generate insulin quickly. This method of beta cell production could provide a more reliable and potentially more cost-effective cell source compared to donated human islets. Not only could this expand the number of islet cell transplant procedures, but could also increase the availability of human beta cells for research purposes. Using stem cells could help millions of people, but scientists have much more work to do before perfecting this method. National Institute of Diabetes and Digestive and Kidney Disease. Pancreatic Islet Transplantation. Pagliuca FW, et. al. Generation of functional human pancreatic β cells in vitro. Cell. 2014 Oct 9;159(2):428-39. doi: 10.1016/j.cell.2014.09.040. American Diabetes Association. Fast Facts Data and Statistics about Diabetes. JDRF. A New Pathway to Beta Cells. Do You Know What Rapid-Acting Insulin Is? Do You Know How to Treat Hypoglycemia?